SHERWOOD — The Sherwood High School girls basketball team didn't have a great shooting night. The Lady Bowmen shot at just a 29-percent clip from the field. But, thanks to their defense, that didn't matter. 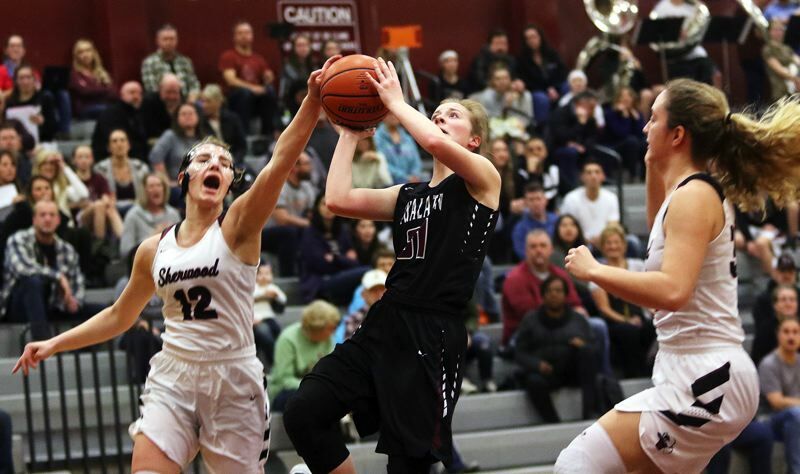 Sherwood, clamping down on Tualatin shooters all game long, scored a 39-25 win over the Timberwolves in a Three Rivers League game played Tuesday at Sherwood High School. "It was good," said Sherwood junior guard Aubrie Emmons, who scored a game-high 19 points. "Our motto tonight was to come out with a lot of energy and get them early." "Our defense has really improved," said Sherwood senior guard Lauren Scarvie, who scored seven points in the contest. "It was all effort. I really think our energy was the most important thing." 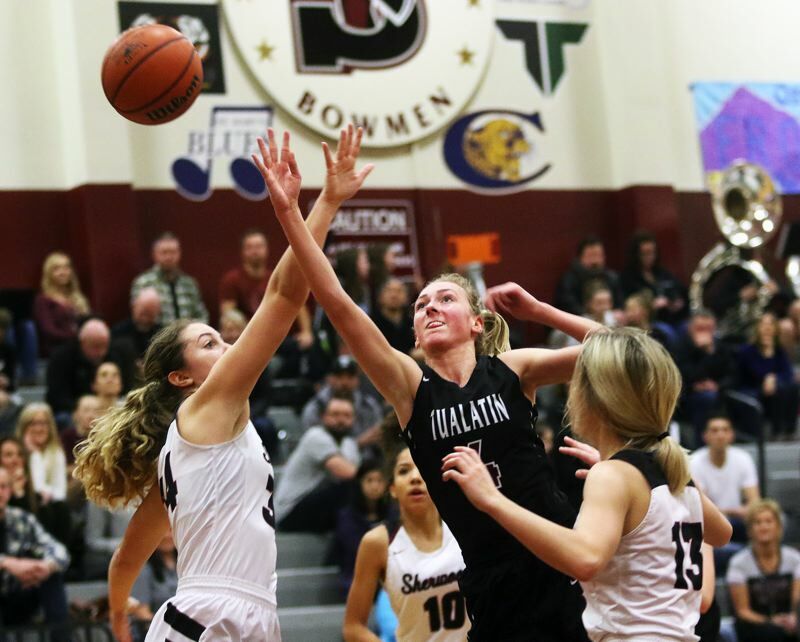 With the win, Sherwood improved to 3-5 in TRL play (8-8 overall), putting the Lady Bowmen in a tie with Lakeridge and Tualatin for fourth place in the league standings. "This was an important game," Emmons said. "We talked about the playoffs, and this will help us get a better spot." The Timberwolves moved to 7-9 on the season with the setback. Sherwood, and Emmons, got off to a hot start to Tuesday's game. Emmons scored the first basket of the game, coming on a drive to the hoop. 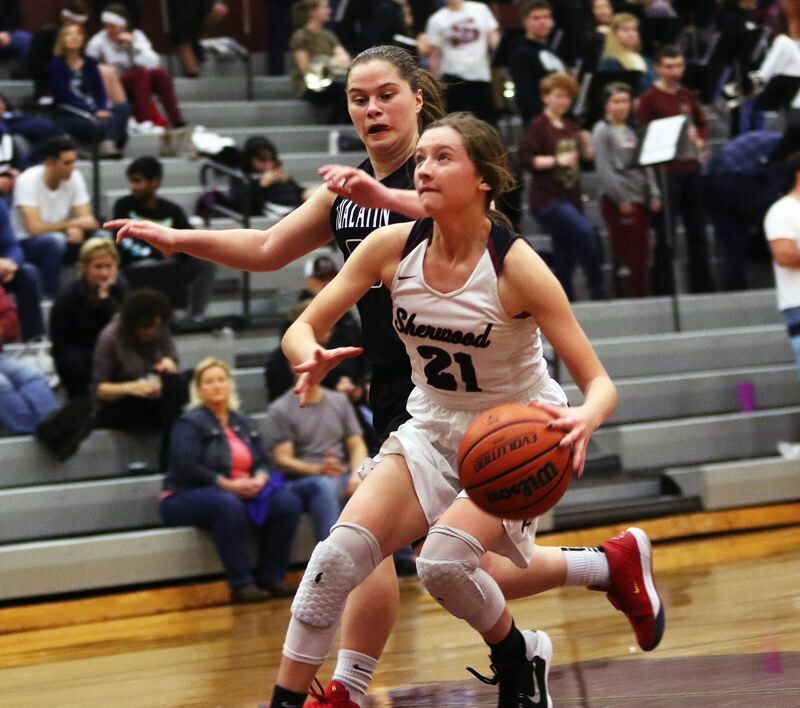 She followed that up with back-to-back three-pointers, both coming off assists from Scarvie, giving the Lady Bowmen an 8-0 lead with 5 minute and 40 seconds left to play in the first quarter. "If I get an open shot, I might as well take it," Emmons said with a smile. 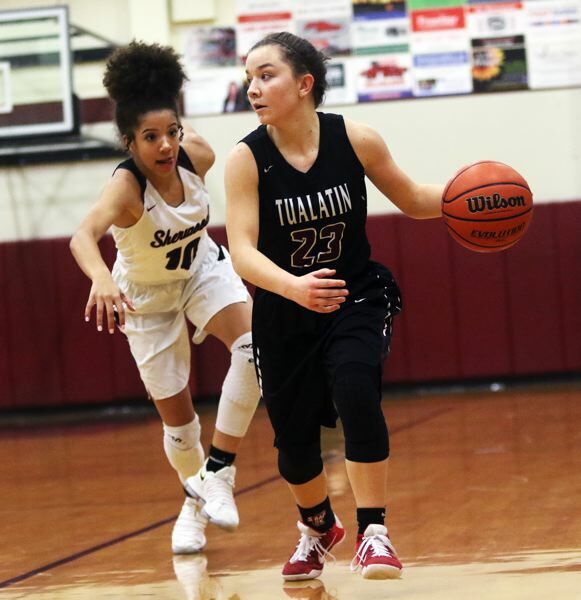 Tualatin stopped Sherwood's scoring run with four straight points by freshman Sidney Dering. The Wolves got four points from junior Natali Denning, and a short-range bank shot by freshman post Natalie Lathrop, coming off a pass from senior Mikah Springer, later in the period, cutting the Sherwood lead to 11-10 going into the second quarter. But that's where the Lady Bowmen got really stingy. 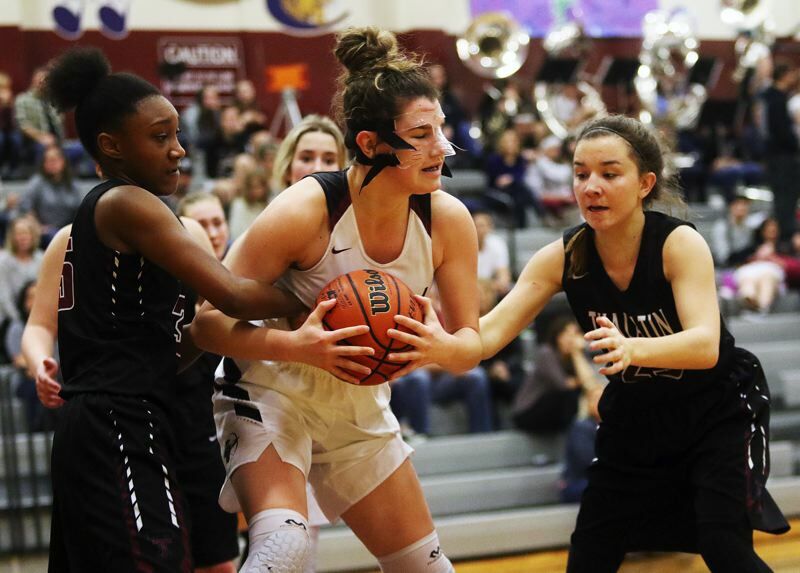 Tualatin missed all nine of its shots from the field in the period, and scored just two points in the quarter, coming on free throws by Denning and Lathrop. Meanwhile, Scarvie and Emmons each scored four points in the period, and junior post Cali Etherington added a basket on a 12-foot jumper, helping the Lady Bowmen take a 21-12 halftime lead. Both teams struggled to find their shooting touch in the third quarter. The Wolves got a basket on a bank shot by Dering to cut the lead to 21-14 with 7:18 remaining in the period. But Tualatin wasn't able to score again in the quarter. Meanwhile, the Lady Bowmen got a free throw by Scarvie and a foul-line jumper by sophomore Julia Leitzinger, giving the home team a 24-14 advantage going into the fourth quarter. The Wolves tried to battle their way back in the final stanza. Senior Maija Girardi opened the period with a basket on a driving jumper and Denning would add a free throw, trimming the margin to 25-17 with 6:10 left to play in the game. But Sherwood, getting free throws from Emmons and junior post Kaytlin Cooke, and a follow-up basket by sophomore guard Ava Boughey, following a steal by Scarvie, upped its lead to 31-19 with 4:45 remaining. Tualatin kept trying to chip away. With Dering, Denning and junior Maliyah Ross all going 2 for 2 from the foul line, the Wolves trimmed the lead to 32-25 with 1:26 left to play. But Tualatin wouldn't be able to score again. Sherwood, with Emmons, Leitzinger and Scarvie sinking free throws down the stretch, was able to pull away for the 39-25 victory. "We've really improved," Scarvie said. "We're a young team, and it took us awhile to get going." Emmons, in addition to her 19 points, also had seven rebounds in the win. Scarvie had six rebounds, two assists and two steals to go with her seven points. Cooke and Etherington each scored four points, with Cooke also having five rebounds and two steals. Sherwood also got strong play from Boughey, who moved into the starting lineup with junior Alex Verkamp out of action due to injury. "She stepped up a lot," Emmons said. "She did a really good job in our press break," Scarvie said. 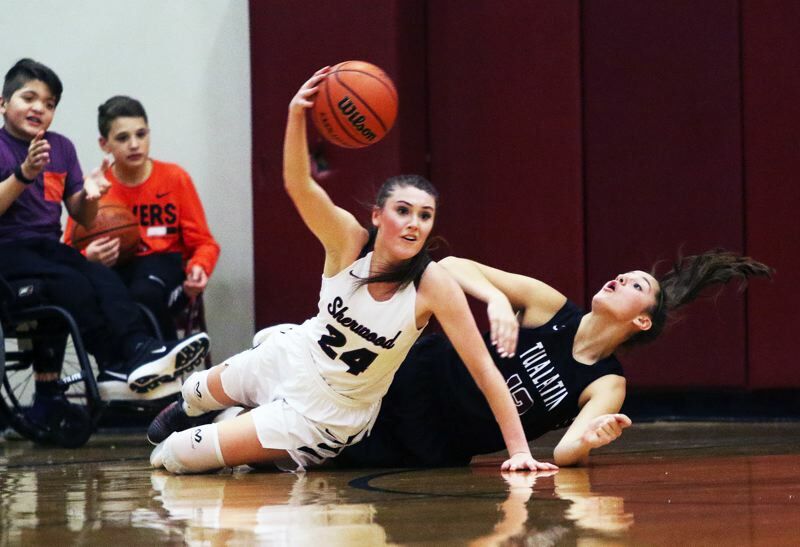 Meanwhile, the Sherwood defense helped force Tualatin into a 5-for-39 shooting night from the field. Dering led the Wolves with 10 points in the contest. Denning added eight points and six rebounds. 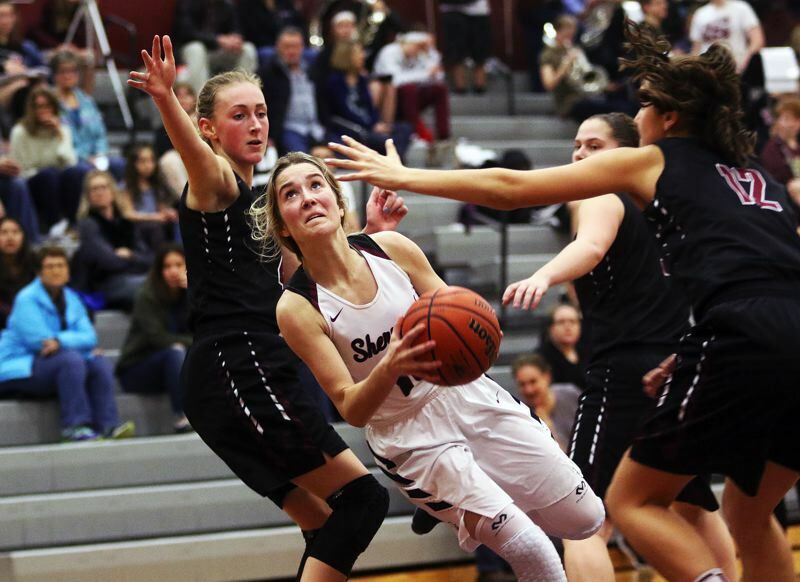 Prior to the win over Tualatin, Sherwood was edged 24-23 by league powerhouse West Linn in a league game played Friday at Sherwood High School. "That proved that we can play with the top teams," Scarvie said. The Bowmen and Timberwolves both return to league play today (Thursday). Sherwood will host league-leading Tigard and Tualatin will travel to Lakeridge for 7 p.m. games. On Friday, Tualatin will host Lake Oswego at 5:45 p.m. On Saturday, Sherwood will travel to Newberg for a 7 p.m. game. On Tuesday, Sherwood will host Canby and Tualatin will play at St. Mary's Academy in 7 p.m. games.